Before the start of the second match against Australia at Perth, Ravichandran Ashwin and Rohit Sharma joined Prithvi Shaw in the list of injured players. On a lively pitch at the new Optus Stadium, India chose to feature four quicks in the playing XI. While Hanuma Vihari replaced Rohit Sharma, India chose to pick Umesh Yadav in place of Ashwin. This is the only the 3rd instance (since 2000) when India went into a Test match without a specialist spinner. On a pitch which provided assistance to the quicks, Indian pacers squandered the advantage of the new ball as they were inconsistent with their lines and lengths. As a result, the Australian openers - Aaron Finch and Marcus Harris - added 47 runs in the first hour. After the much-needed drinks break, the Indian attack rectified their lines and created some chance but the Australian openers rode their luck. For the next hour, Australia could add just 19 runs but did not lose any wickets. In the second session, Australia started off strongly as both their openers reached their fifties. The openers built together a 112-run partnership and were looking to take the game away from India. Just when things were going against India, Jasprit Bumrah provided the first breakthrough in the form of Aaron Finch's wicket. The first wicket was followed up by two more - Usman Khawaja and Marcus Harris - before Tea. In addition to losing three wickets, Australia added 79 runs to their tally in the second session. Early in the final session, Virat Kohli pulled off a stunning one-hander to send Peter Handscomb to the pavilion. That wicket was followed by a threatening stand of 84 runs between Shaun Marsh and Travis Head but the dismissal of the two settled batsmen in quick session kept things in balance. 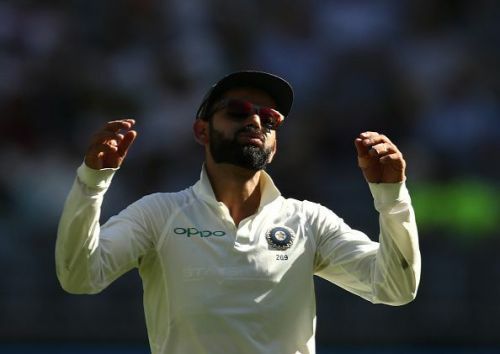 After that Australian captain, Tim Paine and Pat Cummins did not allow India to pick up more wickets. As a result, Australia have 277 runs on board with 4 wickets in hand at the end of Day 1. With the ball doing a bit, Australia would be happy with their situation and will look to make a score in excess off 350. Brilliant overhead slip catch by @imVkohli. Yo! Or should that be Yo-Yo? What. A. Ball. Bumrah. Please India, save everyone but also Bumrah. Have just had Rishabh's chatter translated: Pant to Kohli after two short balls: "He is bowling according to your plan. You only told him to make them cut (after that Harris wicket). Now please tell him to pitch it up." Wriddhiman Saha meanwhile compiling clips of Rishabh Pant's dropped chances to upload to Twitter. Virat made Rohit play first Test so that he may get injured and misses the second Test. He knew the 2nd Test is around Rohit's marriage anniversary and it's known to everyone how he performs on these occasions. Insecurity exposed. Share it! Indian players come back to play after lunch in Perth. I believe Kohli gave his Butter Naan to fast bowlers and had Plain Naan for himself.